One scruffy mutt. Too many laughs to count. Rhymes (and dogs) the way they should be: rumbustious and funny and fantastic. Giggle your way through bedtimes. Hairy Maclary is a scruffy Skye Terrier. What does he love? Chasing cats! Scarface Claw is a rough, tough tomcat. What does he love? Chasing dogs! 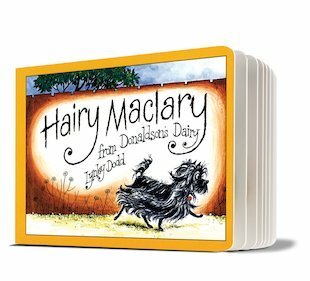 Join Hairy Maclary as he swaggers through town with all the local hounds. They’re very proud of how brave they are – until a certain cat shows up! I used to love this book! I like hairy maclary. The pictures are good and funny. i used to love these books when i was little, i would recommend them to anybody. I this is one of my favourite books from when i was little! Lynley Dodd has won a number of awards in her native New Zealand, and was awarded the Margaret Mahy Medal in 1999.